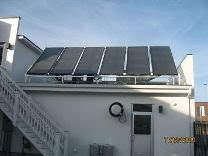 Café 27 in Steven's Point has just finished the installation of a six-panel array of Bubbling Springs Solar's collectors, performed by Bob's Plumbing. Using solar thermal technology in the foodservice industry is highly economical; the sun heats or preheats the water for dishwashing and cooking, cutting down on conventional energy bills. Café 27 is setting an excellent example and we hope to see more solar thermal in the foodservice industry. Check out Café 27 at 945 Clark St. in Stevens Point, WI or call 715-544-4730.